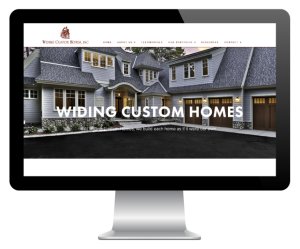 Widing Custom Homes, a luxury custom home builder in Northern Michigan, approached Maneuver Up Marketing to move their website to their own hosting account. After an initial assessment of their online presence at the time, Maneuver Up proposed a number of changes in order to ensure Widing Custom Home’s online branding matched offline branding efforts and that they were getting the best ROI for their marketing goals. 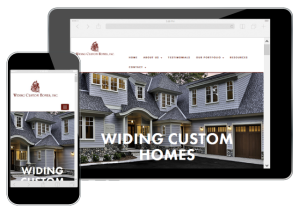 After meeting with Widing Custom Home’s sales and marketing team, Maneuver Up got started on a brand new, completely custom, website built in WordPress. Maneuver Up’s design and development team worked closely with the folks at Widing Custom Homes to create an aesthetic consistent with the luxury home building business. A responsive website was built to allow visitors easy navigation throughout its pages no matter what type of device is being used to browse the web. After careful planning and consideration, the website’s navigation structure was mapped out to ensure the best possible on-site user experience. Maneuver Up then expanded upon the original website’s content after thorough keyword research to assist with organic SEO efforts. One of the key components to the new website was developing a portfolio made up of multiple photo galleries to reflect the past projects on which Widing Custom Homes has worked. The galleries are used both on and offline as a marketing and sales tool. In order to establish Widing Custom Homes as a credible and experienced custom home building company, Maneuver Up suggested a client testimonial page. Additionally, trust symbols, such as a BBB accreditation were placed in the footer of the webpage to further convey credibility. A “meet the owner” page was created to reflect the values of the company and provide a more personable customer service experience. 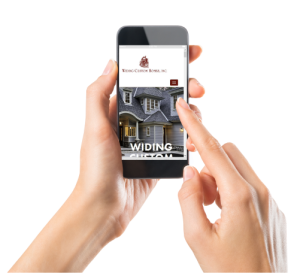 The ultimate goal of all of Widing Custom Home’s web development and marketing efforts is to drive potential clients to take action by calling or filling out a contact form. In addition to the standard contact us page, a form was placed on the homepage along with a call-to-action to maximize on capturing information.